Spider mums are beautiful flowers that grow in the fall. They belong to the chrysanthemum family and typically bloom from October to November. The petals of the flower are long and spiky resembling spider legs. That is why they are called spider mums! We love these flowers and made our spider mums from paper. They are a gorgeous addition to your fall craft projects. Place them into floral arrangements, wreaths or a vase. A plus with paper flowers is that you never need to water them, and will enjoy them all season long and beyond. Download the free spider mum files and place on your computer. Cut the paper spider mum templates either by hand or with an electronic die cut machine. If you are cutting the flower by hand, download the pdf template and print onto a sheet of 8.5" x 11" cardstock of choice. Cut out the spider mum petals with a craft knife and metal ruler. You can cut the round edges with scissors. Curl the edges of the petals forward by wrapping the petal around a pencil giving the petals a realistic look. To form the stem wrap floral apply tape individually around three of the floral wires. Place the three covered floral wires together and wrap with floral tape once again to form a thick stem. Add a little bit of hot glue onto the top of the stem to secure it to the flower petal template. Make sure you are using the flower template that has the short end and attach the stem with glue to the short portion of the template. Wrap the flower petal template around the stem (as in the photo above) and secure with a bit of hot glue. Take the second flower template ( the one that has all long petals) and attach to the flower with a bit of hot glue as in the photo above.Wrap the petals around the stem. Continue to wrap the petals around the flower to form a bud. 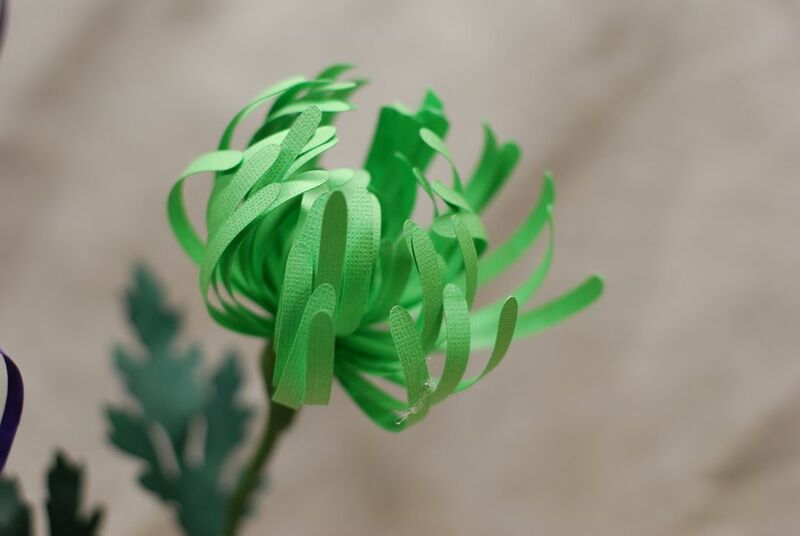 Wrap the receptacle portion of the flower with green floral tape using the photo above as a guide..
Open the flower "bud" with your fingers and push the petals downward to give your paper spider mum depth and dimension. This step is crucial because it gives the flower a realistic look. Cut two leaves from green cardstock by hand or with an electronic die cut machine. Use two leaves to form each leaf. Spray adhesive to the top of one of the petals, then place a six-inch piece of floral wire onto the center of the leaf. Place the second leaf onto the top of the other leaf and press firmly with the palm of your hand. Score veins onto the leaf with a bone folder, and then wrap the leaf stem with green floral tape. Give the leaf depth and dimension by folding and curling the edges. This important step adds a realistic look to your leaf. Tip: Nothing in nature has straight lines. Always curl and bend your paper flower stems and petals to give it realism. Attach the two leafs to the flower stem with green floral tape. Make as many flowers as you need for your flower arrangement and place into the vase of your choice. You could also put them into a wicker basket for a nice rustic effect.